Ski Touring, also known as ski mountaineering, combines the technical pleasures of alpine skiing with the freedom of cross-country. Part of the thrill of touring is the feeling of self-reliance and solitude offered by penetrating deep into the mountains. 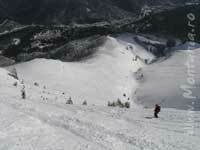 Ski Touring is very popular in the Alps and has gained many fans also in the Carpathian's. 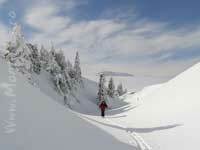 Bucegi mountains are particularly appealing for ski touring. This is due to the plateau at 2000m altitude that creates a great cross country type of environment. From here you can have great descents towards Prahova Valley, on a wide variety of routes, from mild ones, in Sinaia area, to very difficult ones (around 1500m vertical drop), in the region of Omu Peak. Another great feature is that one day trips can be easily made in this region. The access to the top of the plateau is facilitated by the cable cars in Sinaia and Busteni (depending what area of the mountain you are planning to tour). You can enjoy various routes at altitude and exit the mountain at the end of the day on the valley of your choice. At the end of the day you can relax in the comfortable lodging you have in Sinaia. Of course, longer trips can be also planned. This means that the skier has to sleep in one of the huts at the top of the mountain. Most of them are open during winter, so with careful planning a several days tour can be made. 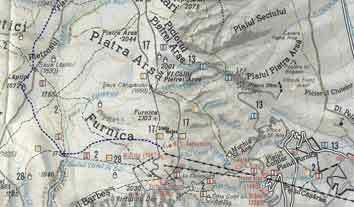 The purpose of these web pages is to give the skier a first look at possible Ski Touring routes in Bucegi Mountains. However, by studying the map one can plan his own routes. In the following we have few suggestions, from easy to more difficult tours. A collection of more complete tours is available (see the brochure below). One can also hire an experienced guide from Montania, so do not hesitate to contact us in this respect, info@montania.ro. A new version of the brochure "Bucegi Mountains - Ski Touring" is available for the interested Ski Touring fans!! 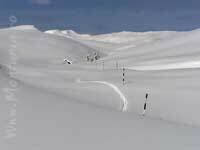 The material contains descriptions (in english) of a great variety of ski touring routes in Bucegi Mountains and other useful informations about touring possibilities in the area (samples of the articles can be seen below). Detailed map descriptions of the tours are included as well. Emphasis is placed on one day tours. 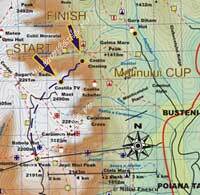 The included maps contain altitude information as well as the most important points you need while making a tour. It has never been easier!!!! 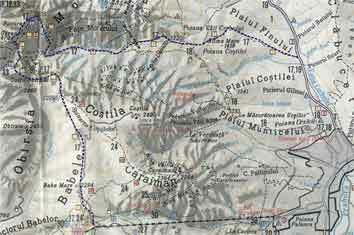 The starting point is Busteni Cable car station. One important aspect of this trip is to take an early cable car. We orientate towards south and we choose as a reference point the Cocora peak (2191m) on which we can see a metallic building that is an old wind weather station. After climbing on this peak we are at the border of two hydrographic basins, to the right we have Ialomita's valley and to the left we have Dorului Valley spring. Now, we take as reference points the peaks that are in front of us towards the south. We start descending from Cocora peak enjoying the snow...in this way we pass Pacala's plane and we are in Cocora's saddle where we intersect the blue stripe trail that links Piatra Arsa hut with Pestera hut. If the snow and weather are good, here is a nice place to have a couple of runs. In this descent we try to stay all the time on the right side of the mountain road, however, this road is not so visible during winter, since it's plenty of snow. During late spring, when there is not too much snow, this road can help us in passing some passages where the snow has melted completely. Staying in Cocora's saddle we have in front of us (looking to the south) a peak that looks like cut, the name is Pietrosul Peak (1930m). We climb on this peak and continue with a descent in Laptici saddle, at 1830 m altitude. Here we intersect again a a marked trail, red stripe, which links the Varful cu Dor hut with Padina hut. From this point we take a look towards Ialomita's valley, having a great panorama in front of us. 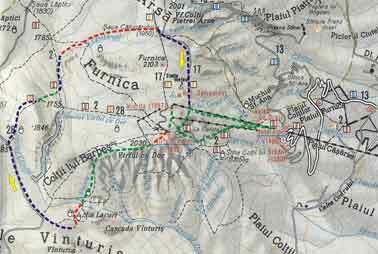 One way is to go now on this marked trail (red stripe) towards Valea Dorului Hut. We continue our journey, going towards Laptici Peak (1872m). From here we descent towards Valea Dorului spring letting our skis in a continuous descent on the Clirului small valley. We make the stop at the sign on which is written "Izvorul Dorului" (Dorului spring). From here we put the skins and we start our climb towards Cota 2000. We pass on the left side a shepard house which is used only in summer and continue our climb staying on the left side on Laptici valley. In a reasonable time we reach the top chair lift station at Cota 2000. From here we descent to Sinaia. There are more options, on Carp Valley, which will give us a black-type of descent or on the Summer road, which is not so demanding. Depending on the tiredness we can choose the descent. Both tracks are marked ski tracks. After this descent we reach Cota 1400 cable car station, from here we can either continue on skis, if there is enough snow (which is typical during the winter) or we can take the cable car towards Sinaia City center. One important mention is that this ski route can be made until late in the spring. We start from Sinaia by taking the cable car to Cota 2000. To make the tour a bit more difficult, one can take the cable car only to Cota 1400 and then continue on skis to Cota 2000. Once at Cota 2000, from the chair lift top station we descend in the left side and then climb on Varful cu Dor peak (2030m). From here we have a great 360 degrees panorama, since this is the highest peak in the area. We start our descent towards the south, our target being a shepard house in Vanturis Valley. The house is the only one in the area and should be visible from the Peak and all the way on our decent. After enjoying the downhill part we reach the valley at approx 100 m of the shepard house. We put the skins and start to go up, passing the shepard house on the right side. We pass at the bottom of Vanturis peak (1948m) on which we do not climb. However, a nice slope is situated in this area, and if there is good snow and weather one can enjoy a couple of runs at this point. We continue at the same altitude level until we reach the ridge, here is the summer road that goes to Babele hut. At this point we continue on the road, the path being almost plane. After approx. 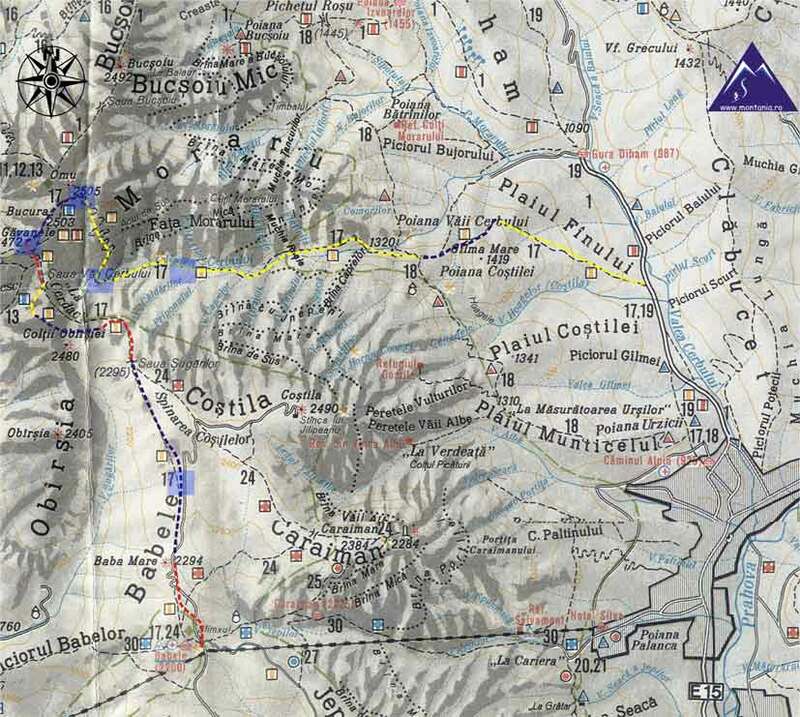 one km we intersect the yellow cross marked trail which links Valea Dorului hut with Bolboci hut. We continue on the marked trail towards Valea Dorului hut. The metallic poles which mark the trail are visible all year around. The path is almost plane and at some point we prepare for the descend. At this point we do not follow anymore the yellow cross path and we descend towards left. We let ourselves catching speed, since the slope is mild. Once we are in the small valley we intersect the red stripe trail and we follow the trail towards north. The Clirului valley is very beautiful, being like a small canyon, however, after few hundred meters the valley opens to the right and we start our ascent (to the right) towards Furnica Peak. We do not climb on this peak and we try to stay on the left of the valley. The climb is mild but long and before reaching the ridge it gets a bit more steeper, after this part we intersect the yellow stripe trail which links Piatra Arsa hut with Miorita hut. We continue to the south, towards Miorita. Now the trail is keeping the same altitude level, so we can catch our breath. The journey ends when we intersect the Carp valley and we note that we are under the cable car line. From here one can descent to Sinaia by following the Carp marked ski slope or we can go forward and descent on the "Summer road" marked slope. ("Drumul de Vara"). During late spring, the "Summer road" is the best option since the snow is still conserved on the road. Rating - this is based on more factors like landscapes, difficulty of downhill, difficulty of uphill. An overall grade which would tell somebody how much this route deserves the effort. Do not start winter trips in the mountains, without reading the Avalache Risk estimation, which is periodically available from the Romanian Meteorological Association (ANM), for th emountains Bucegi, Postavarul and Fagaras, and it is available on the internet. (in Romanian language). - Natural or human-triggered avalanches unlikely. 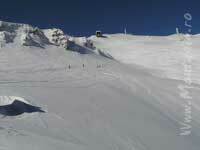 - Skiers should avoid any steeply angled terrain or known avalanche areas. Sinaia Mountain Rescue team, is displaying periodically the Avalanche Risk, at Cota 2000 Cable Car station, in Sinaia. If you pass near this place, please read this bulletin! DISCLAIMER: This page is intending to provide useful informations about possible touristic activities in Sinaia and Bucegi mountains. Some informations may be not accurate, thus WE ARE NOT responsible if the reality is slightly different.